Trent Richardson knee injury: It’s immoral to prevent running backs from going to the NFL straight out of high school. It’s immoral to prevent running backs from going to the NFL straight out of high school. Photograph by Al Bello/Getty Images. 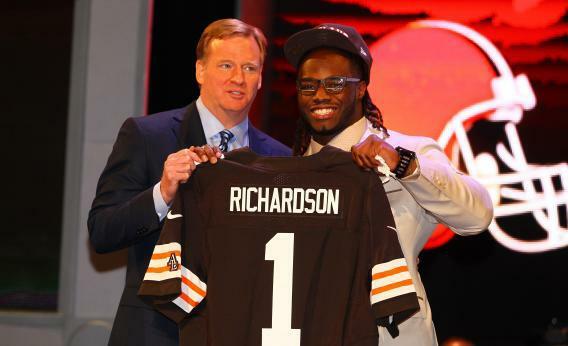 Trent Richardson, the Cleveland Browns’ hugely talented rookie running back, just had his second knee surgery of 2012. The Browns, who drafted Richardson third overall out of the University of Alabama in April, say the rookie will be ready for the season opener on Sept. 9. Even so, the punishment Richardson took in college already seems to be catching up to him. In three seasons at Alabama, he carried the ball 540 times, taking innumerable shots from fast, enormous SEC defenders. It doesn’t have to be this way. Imagine if this was Richardson’s third or fourth pro campaign rather than his first. Though he might still have knee problems, he’d at least have been compensated for his toil and would have a greater chance to earn a second, higher-paying contract before his body breaks down. And Richardson is one of the lucky ones. Consider all the star college running backs, from Marcus Dupree to Melvin Bratton to Greg Jones, who were injured in college and were never the same. For others, it’s a matter of degree. Injuries started to bedevil Adrian Peterson in college. The Vikings running back, who tore the ACL and MCL in his left knee last December, has been a great pro. But how great might he have been without all the surgeries? There isn’t much outcry to change the rule that prevents football players from turning pro until they’re three years out of high school. The toll the game takes on running backs, though, warrants a backfield exception. According to an NFL Players Association study from the early 2000s, running backs have the shortest careers of any position group at just 2.57 years. (That study put the overall average for an NFL player at 3.3 years.) It’s no surprise, then, that injured reserve data shows that proportionally, runners suffer more season-ending injuries than other players. Football is a violent game on both the college and pro level. It’s immoral that the gladiators who entertain us on Saturdays don’t get paid by the schools they’re helping to enrich. It’s even worse that they don’t have the option to play on Sundays, where they’d be able to earn a living as they put themselves at risk. So I’m calling for an amendment to the NFL eligibility rule, allowing for running backs, and running backs alone, to turn pro straight out of high school, or at any point in their collegiate careers. For the large majority of players, the gap between high school ball and the NFL is huge. Most players attempting to make the leap are likely to end up like Evel Knievel—fortunate to live through the experience. While only a handful of teenage runners each year would be ready to enter the pro game early, for them, college ball is merely an opportunity to accrue debilitating hits. Anyone who saw Richardson excel as a backup to Heisman Trophy winner Mark Ingram knew he was physically ready for pro football as a freshman. Ditto Peterson at Oklahoma and Ricky Williams at Texas. (If Williams had come out of school earlier, maybe he wouldn’t have needed to take his sabbatical in 2004.) The position also requires less of a transition period than any other. Though it’s important to learn the nuances of pass protection, the job description for running backs is mostly the same in the NFL and Pop Warner ball: See the hole, and get through it as quickly as possible. Meanwhile, take a look at this year’s preseason All-SEC running backs. Both Marcus Lattimore of South Carolina (torn ACL) and Arkansas’ Knile Davis (broken ankle) are coming off severe leg injuries. Even before his ligament tear, Gamecocks coach Steve Spurrier was running Lattimore into the ground. He had 249 carries as a freshman in 2010, including 37 in one game against Georgia and 40 in another against Florida. He was well on his way to surpassing that total last year when he ripped up his knee in October. Lattimore, whose season begins on Thursday night against Vanderbilt, has no choice but to go back to campus for a third year and continue to get pounded, putting his future earnings at risk. All Lattimore can do is hope that his knee holds up long enough for him to get remunerated for his amazing talent. The NFL is not only savage on the field. Of all the major sports, it also has the weakest safety net in terms of guaranteed money. Allowing younger athletes to play for pay wouldn’t change that, but it would let running backs avoid taking several seasons of collegiate punishment for free. And the more seasons a player accrues in the NFL, the greater his pension benefits down the line when he’ll likely need all the money he can get. Tenpenny wasn’t as diplomatic when I asked about those hits—I could practically hear him wince over the phone. “I got shoulder pain, back pain, I dislocated my ankle, everything hurts,” he said. Tenpenny is a 6-foot, 212-pound specimen who benches 335 and squats 505. It’s hard to imagine anyone denting him in high school, and yet the parade of injuries has already begun. Starting next fall, he’ll be subjected to three years of rips and tears from Athens to Baton Rouge to College Station. Seems to me he should be allowed to try his luck with Atlanta, Baltimore, and Chicago, and get paid to do it.